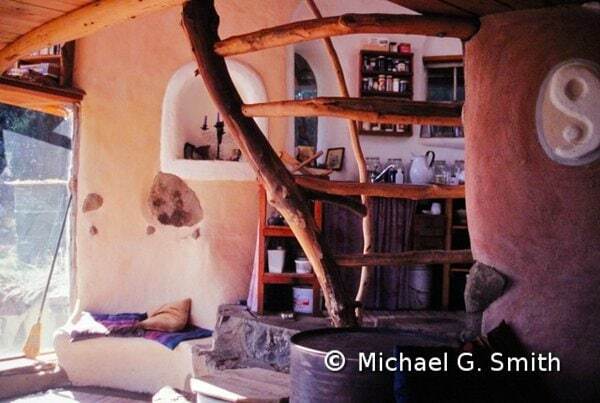 I love sharing my two decades of experience with other people embarking on natural building projects. I’ve been involved as designer, builder, or both on at least 50 natural building projects, ranging in size from composting toilets and outdoor kitchens to a 3,000 s.f. home. I’ve made plenty of mistakes and seen even more made by other people; there’s no need for you to make the same mistakes again. My specialty is designing functional and beautiful compact living spaces, often combining multiple natural wall systems and finishes. I often work with owner-builders on a tight budget. I can very likely save you many times more than my consulting fee by reducing your costs in labor, materials, and long-term energy expenditure. If your project is in Northern California (sometimes I am willing to travel further), I can visit the site and make recommendations for the ideal building location based on passive solar heating and cooling, soil type, drainage, access, etc. I can test your soils and let you know how suitable they are for different building techniques. I can also help with the initial stages of building design: size, orientation, and arrangement of different spaces. If I am unable to visit the building site, I will still make recommendations on what natural building systems are best suited to your needs and resources. I can look over your plans or construction details and suggest ways to make them more suitable or efficient for various natural building systems. I charge an hourly fee for site visits, plus travel time and expenses. I have a lower rate for design work and consulting that I can do from home. Email me for rates. I’m happy to answer any single question about your project for free.